The Personal Tambura® has the look of a traditional instrument, but is actually unique. Many people who have heard the Personal Tambura have asked me what is it that makes it so unique, and sound the way it does. In my short brochure describing this instrument I attribute some of this uniqueness to “an uncompromising attention to detail, craftsmanship and the selection of fine tonewoods.” I also allude to the instrument being “structurally different and acoustically superior” to conventional instruments. The Personal Tambura has fundamental design and material differences from traditional construction. This, plus a meticulous attention to detail and craftsmanship, contributes significantly to a superior instrument. The Personal Tambura was designed and drawn from scratch. It is not a copy of an existing instrument. it establishes a dynamic balance between different parts of the instrument, affecting how they vibrate. This applies not only to the body (wood) of the instrument, but the relationship of the body to the air inside it. The design also takes into consideration the range of the instrument. It was designed to be a bass instrument. It is not simply an “instrumental” tambura with heavier strings. By modifying the jawari and string gauges it can be configured for "Female Vocal" too and is particularly resonant in that Alto range. Though the Personal Tambura is not a copy of an Indian instrument, I have endevoured to incorporate as many of the design features of a traditional tambura as possible. The traditional tambura has developed over a great many years. There are numerous features that are important to keep. Too many “improvements” can make it lose it’s “tamburaness.” One of these traditional features is the shape. I feel it’s important to maintain the traditional shape of the tambura. This means a lot of carving, filing and smoothing. It also calls for the tabli (soundboard) to not be on the same plane as the neck-face glue joint. 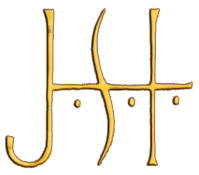 From where the tabli starts, it angles down significantly as it goes to the tail. This adds a considerable amount more area to the tabli, it also means it is carved from a relatively thick piece of wood. The tabli itself is like a large inverted bowl only around 1/8” thick. Another traditional feature is that the tailpiece is carved from the same actual body of the instrument, it is not a separate piece screwed or glued on. (All this is more difficult to make, but important.) It also still uses friction pegs. I feel this maintains a level of integration of all the vibrating parts. The whole thing is open. This means starting with a larger piece of wood (more difficult and expensive, but important). On traditional instruments there is a block of wood (gulu) which joins the neck to the body. Though it saves on wood it creates a weak point, adds weight, extra mass and constricts the movement of air in the instrument. This is a design feature borrowed from South India. It contributes significantly to acoustic response and effects the movement of air inside (more difficult to make, but important). Something common to violins and the like. Size and position is very critical. When an instrument vibrates it literally “breathes”. Air moves in and out of it. Soundholes do many things...they regulate this movement of air, improve the harmonics (very important to a tambura), and improve the resonance. This is also something found in the violin family and is especially important for bass response. It increases the mass of the soundboard under the bridge and distributes the longer vibratory waves of the bass amplitude into the instrument. On the Personal Tambura this is actually carved into the tabli. • Violin-style fine tuners instead of beads. The tabli, as mentioned, is like an inverted bowl. A large area of its vibrating surface is between the bridge and the tail. This is also an area that contributes significantly to bass resonance. If beads are used for fine tuning, as is traditionally done, the tabli has to be thicker at that point and it also needs to be protected from damage from the beads. All this interferes with the best sound. I use violin-style tuners so this part of the tabli remains resonant. • Single upper nut sits on top of the neck. The upper nut is single, not double, and it does not go through the neck in a deep cut (as commonly done). Instead it is carefully shaped to fit over the neck. 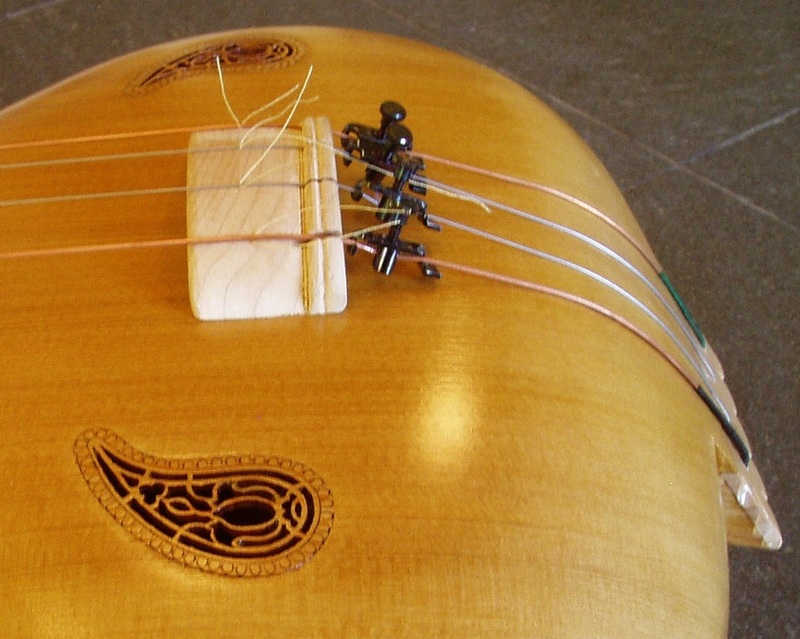 Since the tambura is played with open strings and not "fretted", the nut serves as a second bridge, adding significantly to the sustain and resonance (more difficult to make, but important). In addition to these structural and acoustic design features, I also have devoted a lot of attention to the details of finish and aesthetics: carving from head to tail, fitting of pegs, scroll work in the sound holes, careful finishing, etc. The wood for the instrument is carefully chosen and fully seasoned. I use Coastal Red Cedar for its stability and excellent tonal quality. Not just the physical properties of the wood are important, but what part of the tree, and what cut from the log are very important. 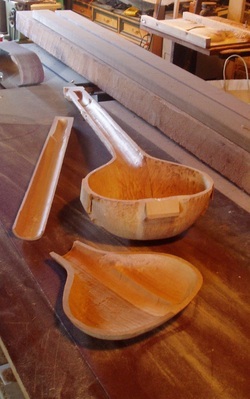 I use straight, clear, “quarter-sawn” wood for these instruments. Quarter-sawn wood is more expensive since there are fewer pieces of this type of cut that be taken from a log. The resulting grain is straight and much more stable, very important considering how thin the wood has to be carved. It also has a beautiful even tone (in color and in sound). The entire instrument is made from matching wood from the same section of timber. The wood for the bridge, nut and tail top is “rock maple” (Acer glabrum). It is important to choose a material that is hard, but not so hard that it cannot resonate with the strings as well as transmit the vibratory energy into the instrument. Maple fits the bill perfectly, as it has been used on fine instrument bridges for hundreds of years. Again, the maple is split, not just cut, so the most stable aspect of the wood is taken advantage of. 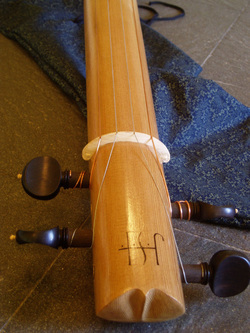 Unlike Western instruments though, the Tambura offers the unique challenge of the jawari. Because the strings lay across a curved plane, as they vibrate they cause abrasion to the surface of the bridge. This was addressed by cutting the wood so the jawari surface is the edge-grain of the maple. Very resilient to wear. I have not had to file the jawari on my own instrument in more than twelve years. I hope this information communicates not only the technical aspects of this fine instrument, but also the craftsmanship and passion I bring to every Personal Tambura.